If you feel like you can’t see the wood for the trees then maybe a career in forestry is what you need! The amazingly diverse and enriching world of forestry means that at Forestry Corporation we offer many and varied opportunities to advance your career and provide you with personally fulfilling and meaningful work. Forestry is not just about understanding trees and forest ecosystems. It's also about working with people, companies and governments to promote and sustain the diverse benefits forests represent. 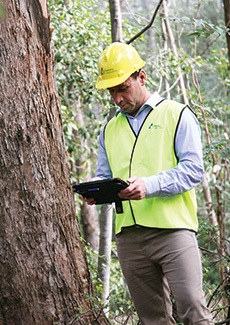 At Forestry Corporation we have opportunities available throughout NSW in a wide variety of roles including forestry, timber sales and distribution, harvesting, finance, administration, human resources, and community and stakeholder relations. Volunteer programs aim to encourage people to actively participate in the management of our State forests. Find out more about volunteering in a State forest. Meet more Forestry Corporation Employees. We’re looking for talented people who share our values and are passionate about achieving excellence. If this is you, please send us a covering letter telling us how you can make a contribution to our business. Please attach a copy of your current resume outlining your experience and any relevant training and qualifications. Find out more about seasonal firefighting.